Prince Harry's comment about videogames making him a better Apache gunner has the Taliban up in arms. 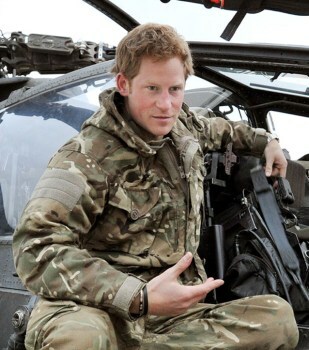 As well as being third in line to the English throne, HRH Prince Harry is also an Apache attack helicopter co-pilot gunner. In an interview conducted shortly after he returned home from a tour in Afghanistan, he claimed that all the time he spent playing videogames during downtime at Camp Bastion helped make him more accurate on the guns. "It's a joy for me because I'm one of those people who loves playing Playstation and Xbox so, with my thumbs, I like to think that I'm probably quite useful," he told the International Business Times. "I thrash them at Fifa the whole time." It was a silly thing to say, although he's hardly the first to say it, but it was also a fairly innocuous remark, inoffensive to all except those determined to take offense at even the slightest, probably-not-serious conflation of war and videogames. People like, say, the Taliban. "This statement is not even worth condemning. It is worse than that," senior Taliban spokesman Zabihullah Mujahid said, adding that Harry was a "coward." "This prince comes and compares this war with his games, PlayStation or whatever he calls it." "To describe the war in Afghanistan as a game demeans anyone - especially a prince, who is supposed to be made of better things," he continued. "It shows the lack of understanding, of knowledge. It shows they are unfamiliar with the situation and shows why they are losing." Mujahid also suggested that Harry was suffering from "mental problems" caused by his deployment. It's a bit rich, coming from a gang that mutilates and murders young girls for such crimes as seeking an education, but the Taliban aren't the only people upset by Harry's comments. Lindsey German of the Stop the War Coalition said the comments were "crass," while an unnamed commander based in Helmand stated, "It's not a game - it's very, very real."